Margie Wilson was announced as the recipient of the WSGS President’s Award for Outstanding Achievement at the WSGS Conference in Tacoma on June 18, 2016. The announcement was made by WSGS President Mikal McKinnon. 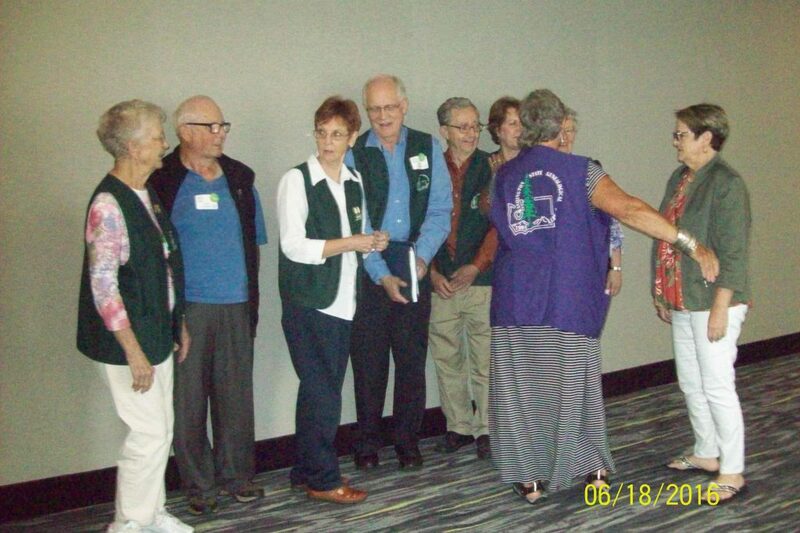 Margie was nominated by the Skagit Valley Genealogical Society (SVGS) where she has been an active member since at least 2008 and has held various offices. It’s easy to see why Margie earned the coveted award. She was the driving force to secure and implement a $23,000 Paul Allen grant for “Making Connections Through ROOTS – Researching Our Origins for Teens and Seniors,” a 20-week credit-bearing course for high school seniors who were at risk of not graduating. The innovative program taught them research skills, how to use library services and resources, citations, family history, interviewing skills and more. Margie worked two years to get the project off the ground, guiding the program from beginning to end, including securing the grant, getting local school board approval, writing the curriculum and arranging for field trips. The program is now being implemented elsewhere around the country. Margie is active in the City of Burlington walking tours and cemetery historical tours. 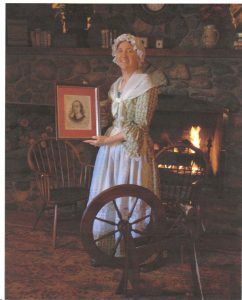 She was asked by the Skagit County Historical Museum to teach 120 7th grade students about the early history of Burlington. 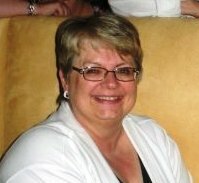 She has also been a member of the local Rotary, Toastmasters and United Way. The drive to Tacoma was going good till we got to Cle Elum and three lanes of traffic merged to one lane at about 5 miles an hour, but that was just a preview of the I-5 rush hour traffic. Glad we only had to go 12 miles on I-5 before we turned off. Went sight seeing at Ocean Shores Friday morning, and got caught in another slow down by Fort Lewis on way back to the WSGS board meeting. Greeted with Happy Birthday at the board meeting when I arrived 15 minutes late. Friday night was a get acquainted meeting with Cyndi Ingals and Paula Stuart-Warren which was great and probably more fun than any get acquainted meeting I have been to. 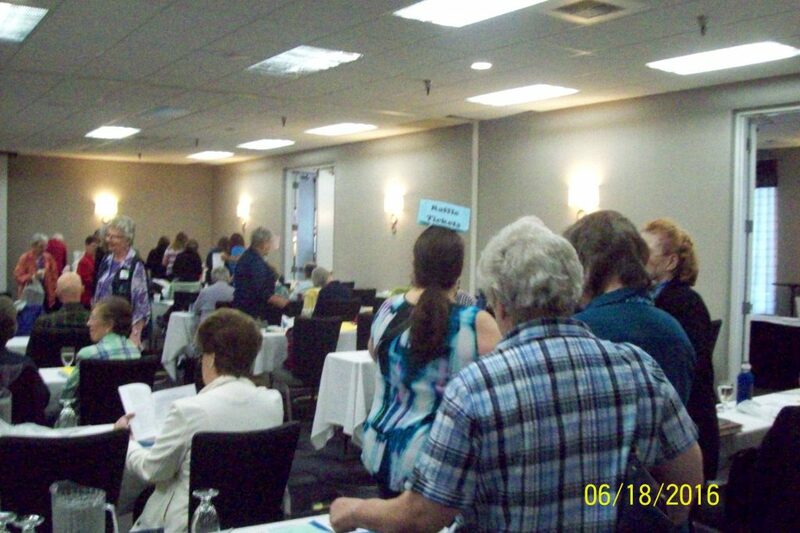 Saturday was the actual conference and it was pretty full, many happy genealogists eager to learn. 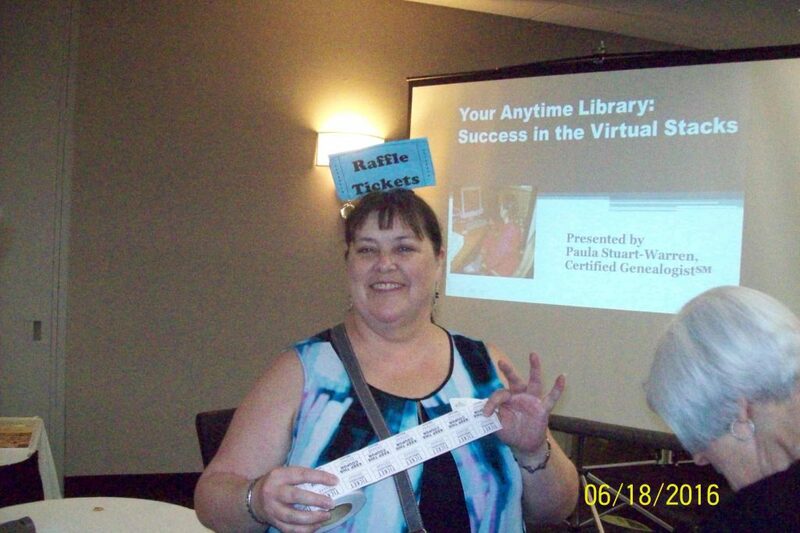 The raffle tickets sold well (but I did not win anything). Had to get a good photo of the raffle ticket seller. My Chicken Caesar and my sisters Cobb salads. After lunch I had an awful time keeping awake, but Paula ‘s subjects were Untrod Ground: Sources you May not Have Encountered and Controlling Chaos: Organizing Your Genealogical Materials. Then the raffle prizes and they had a lot of wonderful prizes. Don’t you just love it when they are lining up everyone for the photos? Well all the WSGS officers that were at the conference except two, one left early and one getting us ready for this photo (my fellow blogger Roxanne). 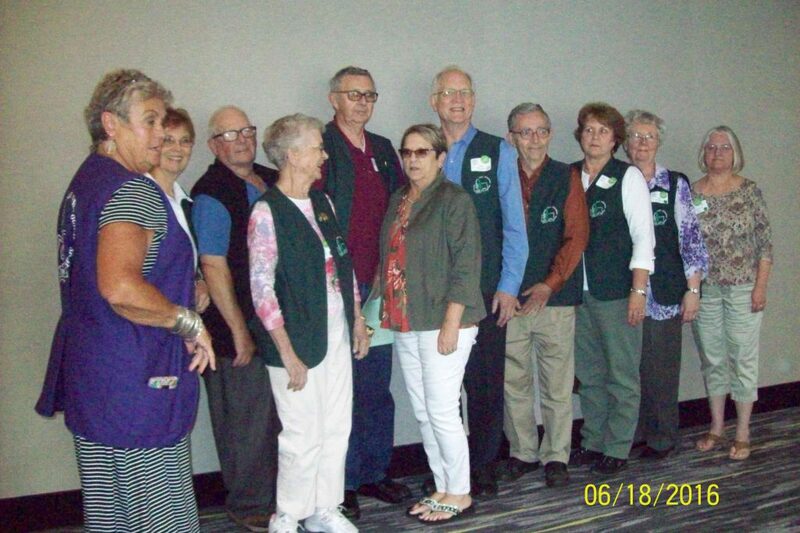 Those of us that were staying till Sunday were invited to a no host dinner with the Tacoma Genealogical Society volunteers and Paula Stuart-Warren where we discussed genealogy while having a nice quiet dinner. The conference will be at the La Quinta Inn and Suites, 1425 East 27th St. in Tacoma and is hosted by the Tacoma-Pierce County Genealogical Society. Registration is $50 if postmarked by June 11, 2016. Postmarks after June 11, add $5 late fee. Walk-in registration is also available, although lunch availability cannot be guaranteed. For registration and more information, visit the Tacoma-Pierce County Genealogical Society website here. national reservation center, who have not heard of any group rate for the conference. So they informed me that as soon as the phone is answered by La Quinta, Immediately punch the number 6 which will take you to the local front desk and they can direct you to reservations, who do know about the group rate. Hopefully this will clear up this problem. Tacoma Pierce County Genealogical Society will be the host for the 2016 conference It will be June 18th. 2016 and held at the La Quinta Inn in Tacoma. The speaker will be Paula Warren. Watch the blog for more details.